Get a sense of the local culture at Canadian Warplane Heritage Museum and Casa Loma. 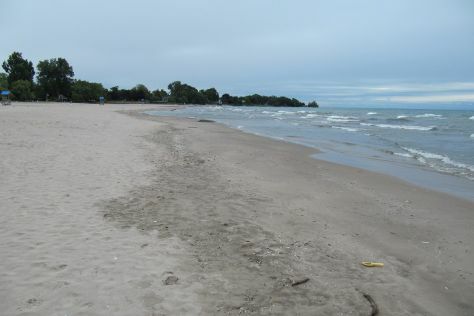 You'll enjoy a bit of beach vacationing at Cobourg Beach and Sunset Point Park. Explore the numerous day-trip ideas around Toronto: Niagara-on-the-Lake (Niagara-On-The-Lake Hockey, Niagara River Recreation Trail, & more), Niagara Falls (Niagara Parks Butterfly Conservatory, Niagara Glen Nature Areas, & more) and Port Hope (Art Emporium by the River & Art Gallery of Northumberland - Port Hope). There's much more to do: identify plant and animal life at Cambridge Butterfly Conservatory, delve into the lush surroundings at Huron Natural Area, explore the world behind art at ZimArt’s Rice Lake Gallery, and see the interesting displays at Royal Ontario Museum. To see photos, other places to visit, more things to do, and more tourist information, go to the Toronto planner . If you are flying in from India, the closest major airports are Lester B. Pearson International Airport and Billy Bishop Toronto City Centre Airport. In January in Toronto, expect temperatures between -1°C during the day and -8°C at night. Cap off your sightseeing on the 1st (Fri) early enough to travel back home.